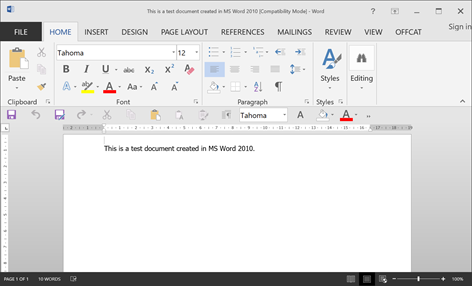 The previous thread was closed with a solution which appeared to be correct (and probably is correct) but I must be doing something wrong or some step is missing because Excel & Word files continue to open in Office 2013 apps even though I specifically designate Office 2010 to run them. 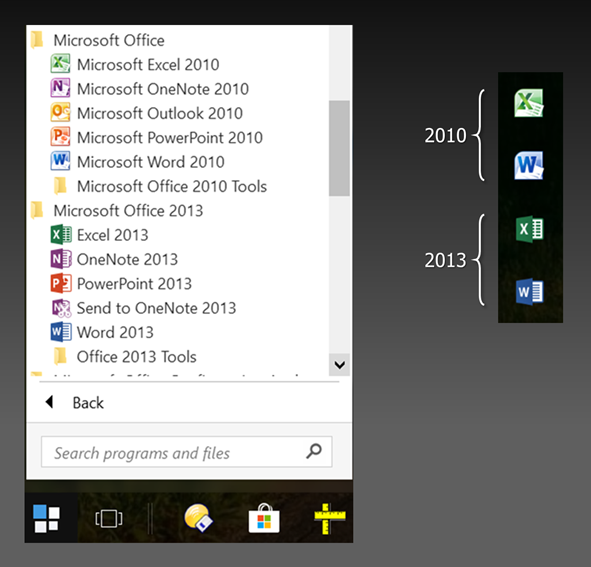 I have both Office 2010 & 2013 installed (see first screenshot) and that has been the case for several years. For much of that time, I was running Windows 7 and had no problem using version 2013 as the default for OneNote and version 2010 as the default for the other apps (Excel & Word, & PowerPoint). However, since upgrading to Windows 10, I have not been able to obtain the same Office default configuration. In other words, I again have both Office versions (2010 & 2013) installed but now all Office app files persist in opening in 2013. Following is a series of comments and screenshots showing what I've tried based on the solution given in the previous thread. The screenshots depict the process I followed for a Word file but the behavior for Excel files is the same. If there is a way to get back to designating Office version 2010 as the default for these types of files, I would sure appreciate knowing what it is. Sorry to hear that didn't work for you. Please can you confirm: does it work at all, or just once, or for some time, then stops working? I can't test on the machine I am using as I only have one version of Office on it. 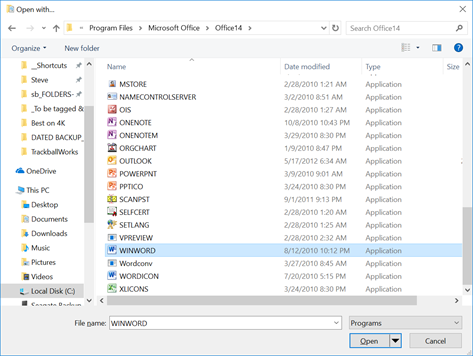 When you have two versions of an Office program on the same PC, such as Word 2013 and Word 2010, you won’t be able to set the older program as the default in Default Programs in Control Panel. 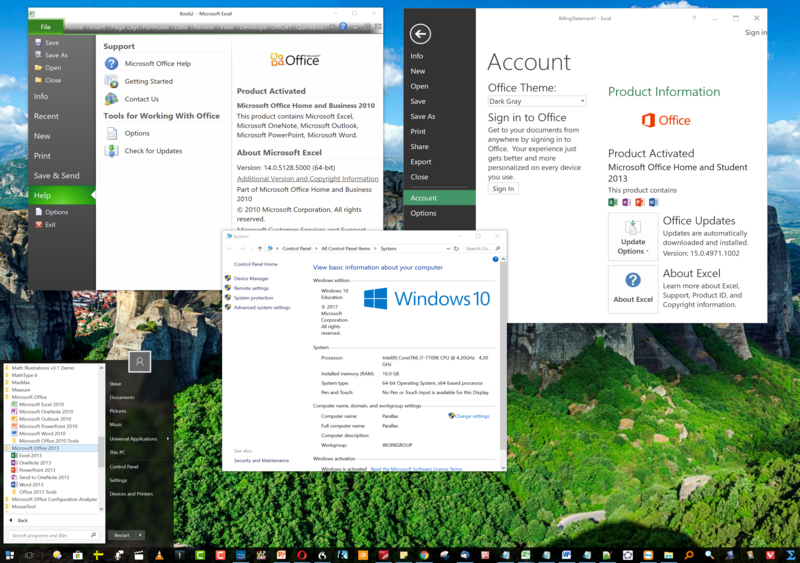 Only the newer version of Office will show in the list of programs. 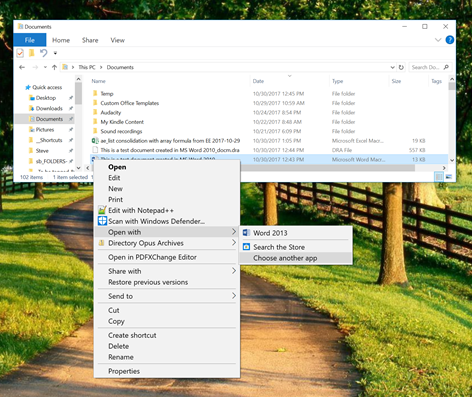 Because you can’t set the default Office program, you won’t be able to choose which version of Office you’d like to use when you open a file. To get around this problem, start the Office program you’d like to use first, and then open the file (File > Open) in the program. 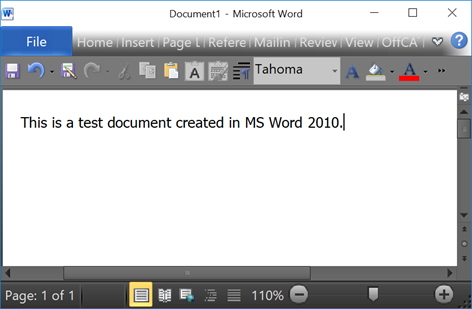 For example, if you’d like to open an older Word document with Word 2010, you’d need to start Word 2010 and then open the document in Word. The outline of what you do seems right. Create an empty new folder. Change the viewing options for the folder to view suffixes. Repeat the file creation three more time changing the suffix of each txt file xlsx, doc and docx. 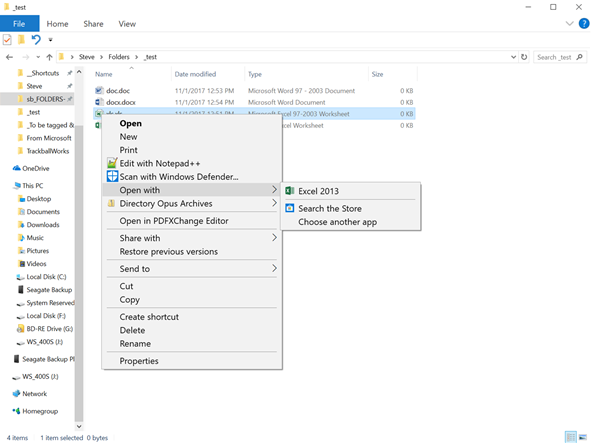 Now right click on each file selecting open with, chose Defaul, check the always open with, advance, locate the 2010 version and ok. The other option, go into settings, default application and change the mappings there. You can Repair Office 2010 from control pannel to fix this but I'm sure you will lose some Office 2013 functionality and I strongly suggest to create a System Image backup before doing this. Since you have the newer version what is the issue that requires theuseof the older? 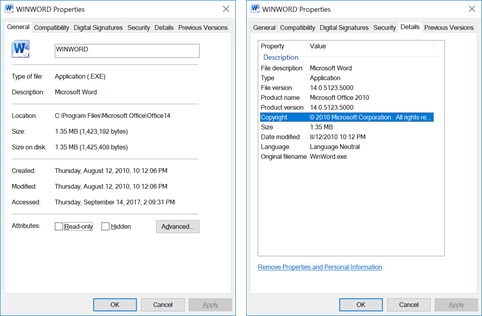 Two versions of MS Office is not a supported configuration in Windows 10. 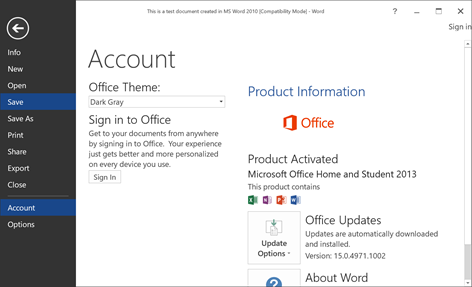 If you must use Office 2010 when you double click the document, please remove the corresponding Word 2013 and Excel 2013 app. The obvious thing, open the application version first, and then open the documents. ...does it work at all, or just once, or for some time, then stops working? I'm not sure I understand your question Alan. Neither the apps nor files spontaneously die or stop working once they are open. 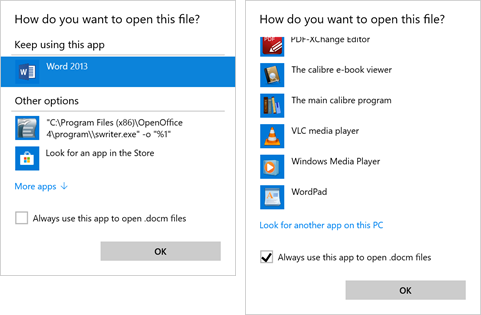 And I can always force a file to open in Office 2010 by starting within the app as shown above in the 2nd screenshot (and the statement preceding it). But anytime I open the file from the desktop, from a link, from within Windows Explorer, or from my Everything search utility, etc, it always defaults to 2013. ...what is the issue that requires theuseof the older? 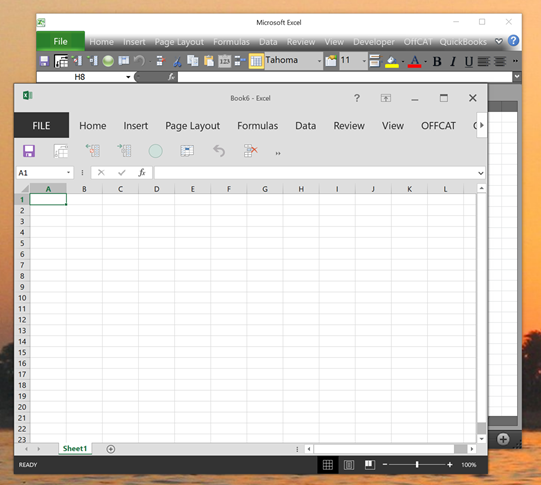 The main issue is that Excel 2010 allows you to open multiple worksheets in a single instance of the app. This enables them to share a single (common) Ribbon, menubar, and Quick Access Toolbar (QAT) as well as other features which are not shared by workbooks open in different instances. 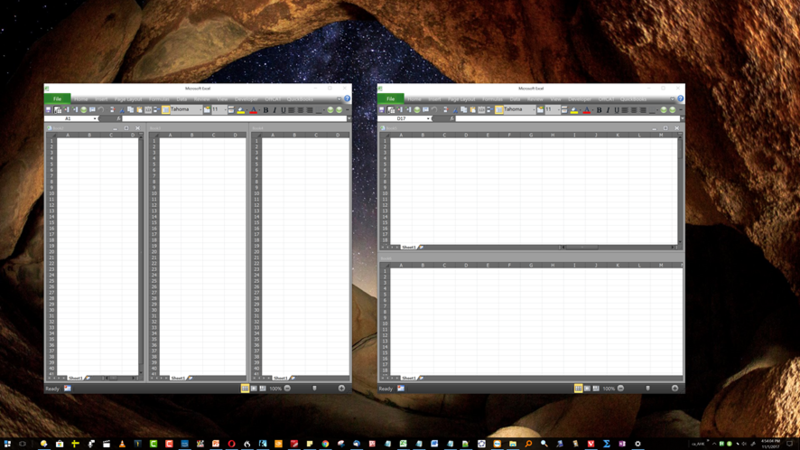 For example, this screenshot shows two Excel instances, one with three workbooks arranged vertically and the other with two workbooks arranged horizontally. A second issue is the abysmal use of QAT space in Office apps after 2010. 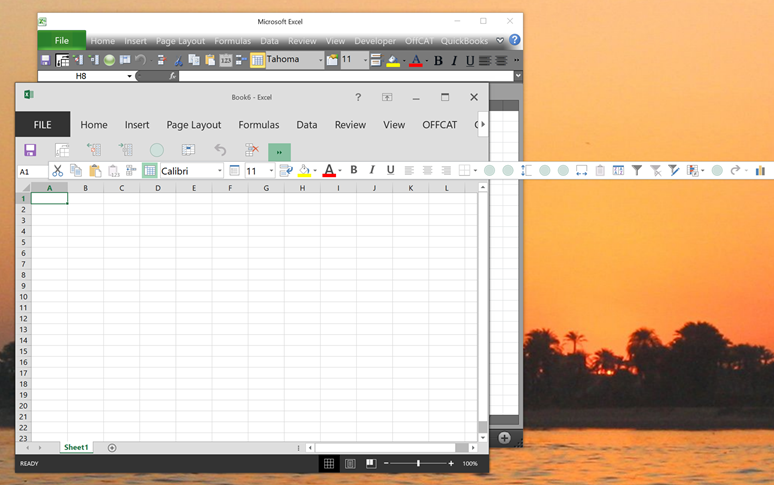 For example, the following screenshot shows an Excel 2010 window behind an Excel 2013 window. Note that while 2010 gives you quick (single-click) access to 25 QAT shortcuts (including the extra-wide Font & Font size icons), 2013 — in about the same width — gives you quick access to only eight. Part of that disparity is due — for reasons I've never been able to discover — to the QAT in 2013 being truncated much earlier than is needed which leaves a large area of empty real estate to the right. The consequence is that an extra click is required to see/access several shortcuts which could have easily fit in the window. ...start the Office program you’d like to use first, and then open the file (File > Open) in the program. Please see the second screenshot in the OP with its preceding statement. If you are referring to multiple versions of Office 2013/2016, it is supported but not Office 2010/2013 in Windows 10. The opening of two windows versus having a tabbed single instance, does mean it consumes more memory comparatively. You started your question dealing with versions. If you have a more specific reason like the one you mentioned in your last comment, could you calrify what it is you want. i.e. you have two documents opened. you want to be able to refer to QAT can be customized, which you might have done in excel 2010 and would need to again for office 2013. Jackie, I am running Windows 10 and the screenshot in my OP is from Windows 10. 5) does not the final screenshot in this post demonstrate that the 2013 QAT has already been customized? I am having difficulties understanding. If possible, let's try and define the issue you hope to address. Since the installation of office 265 2013. The bahrior you need/are accustomed to when dealing with two open workbooks and having some kind of interaction between the, using QAT when excell 2013 opens the files that appear as individual excel instance, versus the 2010's behavior where the workbooks were held in a tabbed view. What is your expected, needed functionality? I'll try to see whether there us an alternate handling that does what and how you are used to. Would tiling not do for you what the tabed view did? I think that the issue is merely a difference in appearance but not of functionality. i.e. if you in document1 select a sell,= then go to the other document, and select a cell, the original document will reflect the path to the document, and cell reference. An EE moderator (Mr. Wolfe) suggested I try dragging a file from Windows Explorer (WE) to the to the Office 2010 taskbar icon. I had never thought of that solution before but it works, albeit in an unanticipated way. With both 2010 & 2013 versions of Office installed (see 1st screenshot in OP), I first made sure the icons for the 2010 apps were pinned to the taskbar. 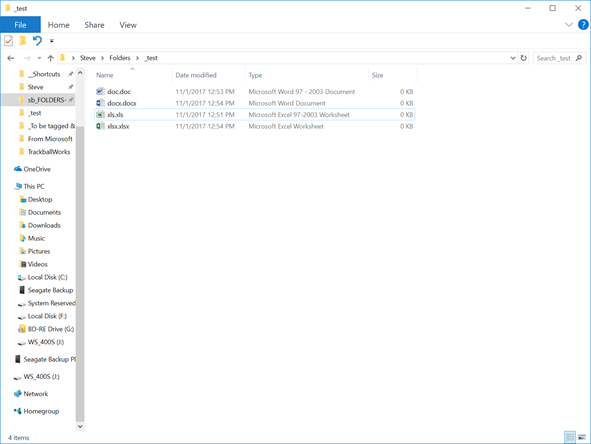 Dragging an Office file to its corresponding icon does not cause the file to open but does cause it to become pinned itself. I did not notice that at first and concluded that the method was not successful. However, when I happened to right-click the app icon short time later, I noticed that in addition to the "Recent" list (which has always been there), there is now a second list with the heading "Pinned" which DOES contain the name of the dragged file. And clicking that filename does indeed open the file in its Office 2010 app. Furthermore, although the above describes a two-step process, I found that subsequent openings from WE (of that same file) will always occur in the 2010 app since that is where the file is now pinned. I use Excel much more than I do Word and it happened to be an Excel file I initially dragged to test Mr. Wolfe's suggestion. When I first concluded (wrongly) that the suggestion was not successful, the idea came to mind to try dragging the file onto the body of an already-open Excel file. And what was my surprise when the file opened! Furthermore, a small amount of additional testing led me to discover that, should I have more than one Excel instance running, I can control which instance opens the file simply by dragging the file there. So that is actually a step-up on Windows 7 where files clicked in WE open only in the first instance. I'm selecting my last post as the best solution so future viewers will know it is the best solution.